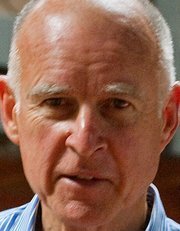 Jerry Brown has union backing – but his record as governor suggests he’s not the pushover portrayed by Meg Whitman. It’s refreshing to see a politician who can be realistic without selling their sole to the rich like Arnold and Meg. You have to wonder about the motives of those who buy elections? Are they the “special interest” they are accusing others of catering to? Every group has things they want the government to do or not do but only unions are villains for trying to do get them to see their point of view. Meg is just another Arnold/Bush looking out for the rich and making the working class the scapegoats. Lets not forget what really brought us to the edge was a policy of more for the rich and less for the poor and working class. Funny noone ever brings up all the huge rases Arnold gave to those who make the most…..